My Dog is Coughing and Sneezing! What could be happening? I do not know about you, but I really suffer from allergies in the Fall. Ragweed, pollen mold… My kids just started coughing and sneezing this week. This started me thinking about similar symptoms in our pets. First, I want to discuss the normal respiratory system in dogs to help everyone get a clearer understanding of what is happening when coughing and sneezing occurs. The respiratory system has a lot of defense mechanisms in place to protect the airway. Think of all the bacteria and debris we inhale in a day. Our airways have to be strong to prevent those inhalants from making us sick. One of the unique defense mechanisms we have is the mucociliary escalator. This system, depicted in the diagram below (from veterinarypartner.com) helps to move all the bacteria and debris back up to the throat area where they can be swallowed or coughed out. When this system is disrupted, infections occur. This system can be compromised by stress, allergies, and cigarette smoke exposure, to list a few. Why is my dog coughing and sneezing? Yes, that’s right, our pooches can have the same symptoms we do in allergy season (sneezing, coughing, eyes watering, itchy skin, itchy nose, etc…). Pets inhale the pollens and molds, which irritates the lining of the nasal passages and/or the throat, causing them to cough and sneeze. Coughing and sneezing can further inflammation, leading to more coughing and sneezing (rhinitis/sinusitis). An upper respiratory infection is a viral, bacterial or fungal infection of the nasal passages, larynx, and trachea (windpipe). Sometimes an upper respiratory infection looks identical to allergies. Other times, especially when bacteria are involved, there may be a thick or colored (usually white, yellow or green) nasal discharge. Upper respiratory infections can be passed between dogs, but most of the time upper respiratory infections occur when the mucociliary escalator has been disrupted. As mentioned above, this can be due to things such as stress or even allergies. Just like colds in a child’s daycare, these infections can spread between dogs quickly especially when they are kept in close quarters, playing with others at a dog park, or even playing with others in a back yard. Since a viral infection can look identical to allergies, these situations can be difficult to prevent. Luckily, most upper respiratory infections can be easily treated or can go away on their own. 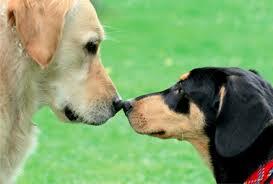 If your dog is suffering from coughing and sneezing, please call us to schedule an appointment. We can help make your pet more comfortable and reduce allergy or respiratory infection symptoms.